This is going to be a little different as it pertains to a particular workout that DCL performed on September 18, 2018. This was a great workout and an experiment for me as a programmer/coach. As previously stated in my other post on the three metabolic pathways, a great athlete is proficient in all three. Those are the phosphagen, the glycolytic, and the oxidative. I am a believer in genetic testing and how some genetic tests can predict one’s ability to be proficient at one or two over the other. You will naturally be better at one of the pathways, but it doesn’t mean you can’t get better at the others. This test was performed with all athletes who performed the workout that day but none who have had genetic testing, except one— me. This was a test of two questions: 1. Was the test accurate? 2. Are some of my best-performing athletes (based off previous scores on both metabolic conditioning work and strength work) neglecting parts of their athletic abilities? 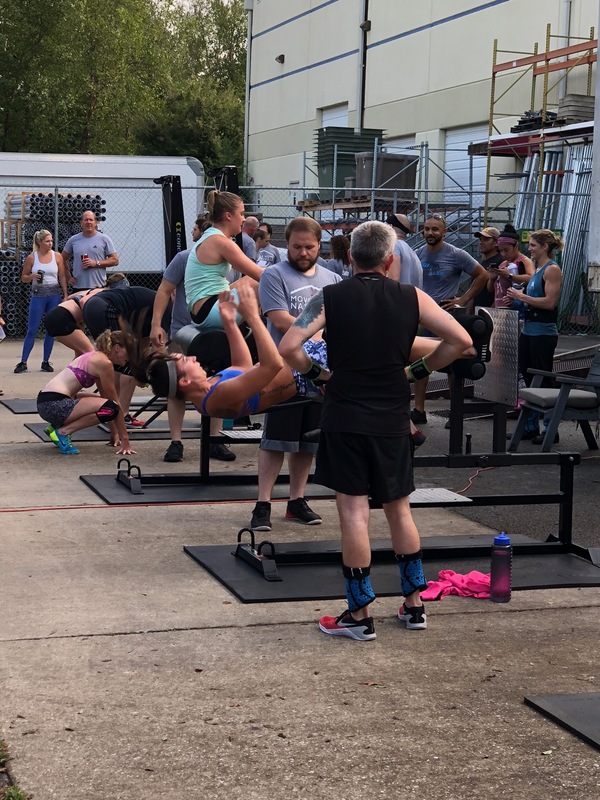 So let’s start with the workout- it was five rounds for maximum reps of GHD Sit Ups, Thrusters at 75 pounds for the males and 55 pounds for the females, Push Ups, and Kettlebell Swings at 55 pounds for males and 35 pounds for females. You performed 30 seconds of work and 30 seconds of rest and moved on to the next movement. We chose this specific time interval because, according to the CrossFit Level 1 training manual, the phosphagen metabolic pathway is the primary energy source for movements that last for up to 30 seconds. After 30 seconds you start using you glycolytic pathway. So we are on the max end of the phosphagen pathway. This pathway needs a minimum of 30 seconds and maximum of 90 seconds to recover. So we used the minimum time required for rest required. Going into the workout I did not tell anyone what the experiment was, they were blind to what we were going into. I just wanted everyone giving their all in the workout without the pressure of knowing what was being tested. I recently completed some genetic testing through Athletigen. Through this testing I discovered that my genetics favor sprinting and high power movements. The gene I’m referring to is ACTN3. This is known by some some as the “sprint gene”. I have always assumed I’ve had this ability from my time playing baseball, soccer, and football. I could sprint off a line rather quickly (even though admittedly I hated it) but maintaining this top speed never worked out too well for me. Another gene I carry is linked to having lower lactate threshold trainability. When reading my results, it began to make sense to me. I can usually hold my own in workouts at 3..2..1..GO! But find myself slowing down as the workout goes along. After discovering this study of my genes, my workouts and the sports that I chose to play makes sense. I have never been a fan of long distance runs or anything that required long distance or long duration. I am genetically a better sprinter than long distance worker. Now that we have the workout and my genetics, let’s talk about me. I consider myself an average CrossFitter. I can do just about any movement and can hold my own in heavier weight workouts despite my 160 pound body weight. My problem has always been my times. In ‘rounds for time’ workouts I am always middle of the pack or towards the back of the pack. Very, very rarely I find myself in the top five of my gym and when I do I am several minutes or multiple reps behind the top athletes of my gym. So what happened in this particular workout? The results for me are very interesting. I finished in the top five athletes in the gym. One person I tied with routinely beats me by several minutes in workouts. For reference, he beat me the day prior by 2 minutes and 31 seconds. Another only beat me by one repetition. What does any of this mean? Understanding that this is only one test but I do believe it speaks volumes about what my strengths are and what others are failing to train for: The phophagen metabolic pathway. Again, this pathway dominates high power activities and lasts for at most 30 seconds. Based off the results of this test I was able to hang with my higher level athletes in a test that required very high power for short duration. Any higher duration and I probably would have fallen way further behind these two and many other athletes. Are there other factors that could have come into play? Absolutely, but I do believe that my genetic ability to handle short high power durations was key to my success in this workout. My genetics favor these workouts and greatly enhanced this ability. Where do you see this outside of CrossFit? A running back’s ability to power through a defensive line but then sits out for 2-3 plays to rest his system. A soccer forward who can sprint incredibly fast but again have to walk after she gives an all out effort chasing down a pass and taking a shot on goal. These are specialists in their respective fields. A great athlete is competent across all metabolic pathways, clearly there is a huge hole in my own athlete potential. This was only one experiment that I conducted. It is by no means a scientific study or a conclusion of different athletes’ fitness levels. This is strictly made to make you think about your own abilities and where you are biasing your own program. Is there a hole in your fitness level? I hope this will help you identify and understand the different pathways and how, what I believe to be, the most utilized pathway is critical to performance.